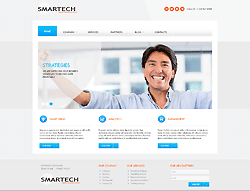 002055 Responsive Joomla! template is based on the Bootstrap and AS Frameworks. The Bootstrap Framework makes it fully responsive to all screen resolutions and aspect ratios, the AS Framework allows you to customize our templates with minimum coding knowledge. Solid design is one of the key points that is recognizable and prestigious name of your company. If you're looking for a template that can effectively present your business, here it is. This sleek modern layout with the thought-out use of space for featuring content and wise prioritization of its important parts is perfectly tailored for communicating ideas of your company. Being responsive, this design will look undoubtedly impressive on various handheld devices.